Don’t you think the title is enough to describe the beauty of the place we are going to talk about? Are not talking total sense! 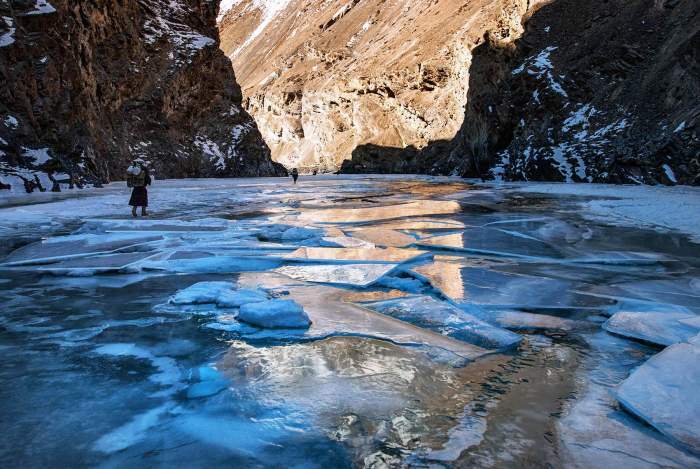 The Zanskar Chadar Trek in Ladakh, let us assure you that there’s something which will arm you with immense attraction and calmness and make every bit of your life worth! 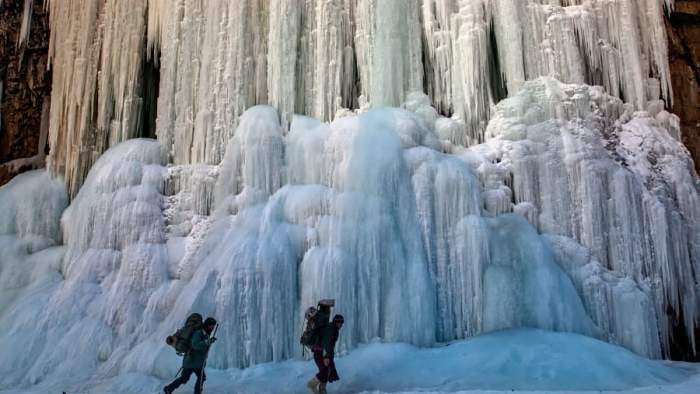 The gigantic mountain blocks the chilly ways, a sheet of snow comfortably conquer a wild river underneath, and blood-chilling temperature in that territory which spans 75 km long trek. If adventure is not your type? Then hit this place to get the best as this trek will brainwash your mind to think of adventure now itself. Chadar means sheet, right? 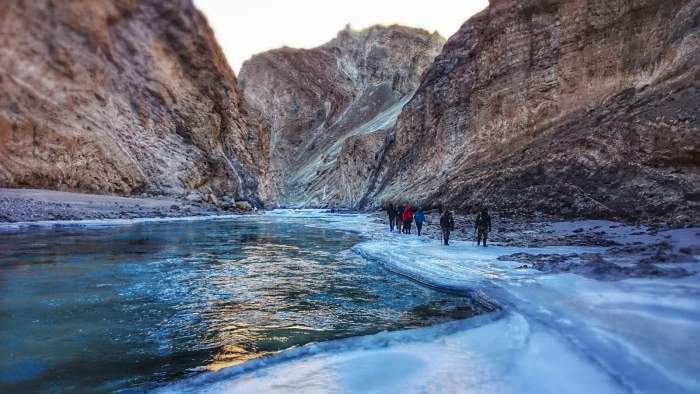 So, chadar trek is all about the thick sheet of ice, which sometimes becomes the slave of the ever-ferocious Zanskar River and the civilization living beyond the valleys and ravines of the valley get hidden by snow. And then the ice on this river allows residents of this remote valley to reach out to the world in case of emergencies. 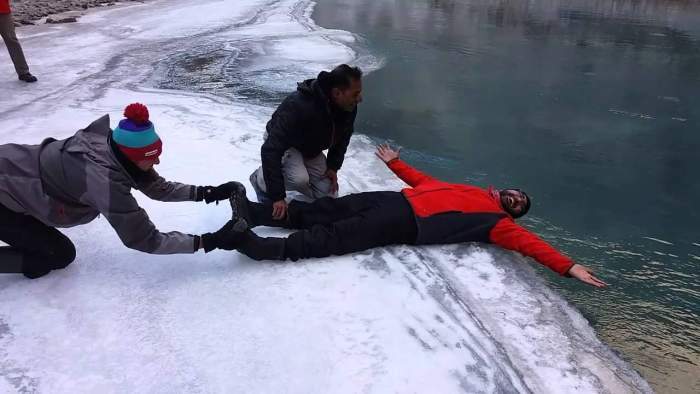 Trekking at various places is a passion or fantasy but Chadar is out of this world. It’s the closest you can get to walk on a glacier. The difficulty level is on another height, the thrill-o-meter, the experience tops all the treks you could ever imagine. The absolute idea of a successful expedition on these large snow stones detached from the surrounding land is unparalleled. It’s not just a trek, it’s a dream world bucket full of rejuvenation of a different kind. And if you want to be a part of it, you need sheer carefulness and preparation. The Best Time To Do Chadar Trek? January and February; in the middle of January till late February that one can have the pleasure of raw thrill of walking on a frozen river. Usually, the trek takes 9-10 days, and one has to cover a minimum of 16-18 km per day. 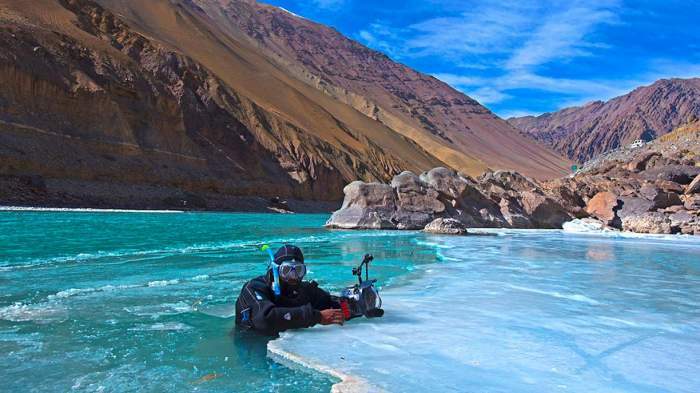 1,300 feet above sea level, a bone-freezing bizarre surrounding, and a violent river ready to break the ground at any time it wishes- all of this is ready for a distance of almost 75 km to Zanskar Valley. We are sure, you are not planning to explore this heavenly trek in your sandals with a stick in one hand and a portable speaker in other. Take all the accessories you need. Buy gumboots as normal hiking boots are not enough. They stop the feet from frostbite. Remember, not to get wet easily and cost INR 400. Extra pair of shoes, socks, waterproof gloves, body warmers, flask bottles, exothermic pouches, trekking rods, a couple of sleeping bags are some of the most basic things. Spend 400 bucks. The extra pair of socks, waterproof gloves, body warmers, flask bottles, exothermic pouches, trekking rods, some sleeping bags are some of the most basic things. If you have never visited a trek that requires adaptation, we then recommend you to take it more seriously this time. For January Trek, we suggest you spent at least 2-3 days in the winter of North India. Unless you are camping and hiking with proper gears on in subzero conditions (-8 to -5 °C on average) conditions, you will feel that the cold is just what the brain thinks or says. Physical fitness is important. Start working and build some stamina before going you head towards Chadar. After all, you are going to experience some of the rarest heights. 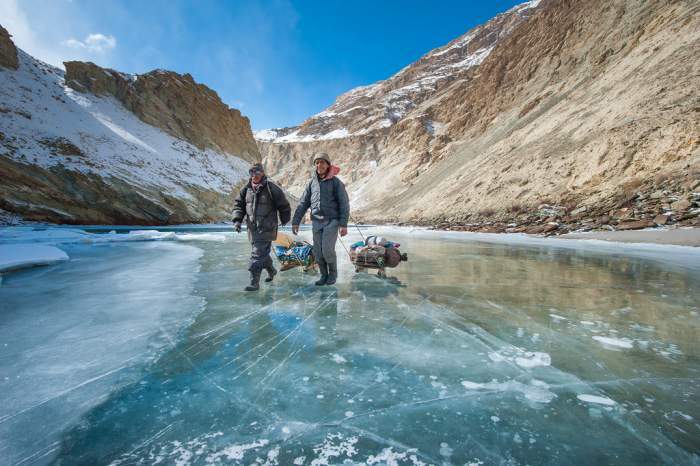 To reach Zanskar, the only way is through the air. The nearest airport is Leh and all the flights are on the ground before noon. Be ready to come out of your plane because bone-freezing temperatures are waiting for you on the vast distance of white ice. to Tilat Sumdo which is the starting point. One of the most intriguing adventures on earth, this trek is a gripping journey that goes through some of the most breathtaking panoramas on Earth. There is a campsite for the trek, Tilat Sumdo. It’s the confluence of Zanskar and a small stream. The trek starts from here. The next comes is the Shingra Koma, which is about 10 km from Sumdo. After Koma, on the second day, comes one of the most beautiful spots of the Chadar trek — Tibb. Tibb is full of caves and waterfalls. The caves are used for night stays and waterfalls are used for framing some of the most scenic vistas of the most picturesque landscapes of the Himalayas in Zanskar valley. The Nerak follows Tibet on the third day and on the 4th day comes with another campsite called Gyalpo. On a tilt in the river, this beautiful place is full of the walls of rock like human faces. Here is the Dreamlike is the apt word to explain the sights here! Trek goes through the Dibyok ma on the 5th and 6th day and ends at Ling shed by the 8/9th day. In Ladhak, Ling shed is one of the oldest villages you’ll find there. One of the oldest monasteries in the world is part of this village. It is one of the most beautiful places on the trek. Local people have opened their home to the tourists. But hold on, what about lodging and food? Not to worry, all trek organizers take care of camping and food. Another popular accommodation option making headway to the Zanskar Valley is cave camping. In some of the most beautiful nights, exactly in the middle of nowhere, there is definitely no extraordinary experience other than dining and living in caves. But apart from adventures, there are many homestays that are simple and warm when you walk along the Chadar Trek. So, before backpack to the one of the most fascinating, mysterious, and magical trek, here are some of the points to keep in mind. Control that adrenaline rush for a good period of time. If something doesn’t work then do not lose heart. Follow the local people. They know best of the Trek. Do not do anything which locals are not doing. Take care of the peace with falling and failing. You will slip on the ice and will have to get up – this will be the case for the first few days. Take enough food and drink water, food may fall short. Keep a handy first aid kit. Bring your meds as the cuts and injuries are something you’ll often face. Don’t underestimate the weather reports. Keep sync with MET records. Not having food is the last thing you would want to do. Trek is demanding and it will be needing strength and you need to be on your toes even when you’re asleep. Don’t’ try to ignore the guide. Follow them religiously. Do not litter, don’t use soap in the waterfall for the obvious reasons. Don’t overstress. When you feel, a break is required, take a break. Sheet Trek packages range from INR 18,500 Most of these are group treks, where the package doesn’t include airfare, airport pickup, drop, personal expenses, and luggage carriage charges. However, these specially designed packages normally include meals on service taxes, professional trekking kits, and guide, and meals on trek (veg only). Some of the well-know Chandra Trek organizers are Chadar Trek; Road Trek Ventures; Adventure Nation; and We Nomads. There are many popular trek spots in Ladakh. However, some of the top names include Zanskar Range Trek, Markha Valley Trek, Chadar trek, Nubra Valley Trek, and Stok Kangri Trek. Cost of trekking in Ladakh varies from 15,000 to Rs 45,000 per person. Although, prices entirely depends upon types of services, accommodation, location, duration, etc.